paper 0-15-600592-1 A blazing diatribe against the media for its pernicious long-term effects on children’s minds. Addresing herself primarily to parents, Cantor offers anecdotal evidence, based on 15 years of extensive research, that “frightening media depictions,” from the Wicked Witch of the West in The Wizard of Oz to the more terrifying effects in Poltergeist, cause lasting damage. In fact, TV programs and movies are, insists Cantor (Communicaiton Arts/Univ. of Wisconsin, Madison), “the most preventable cause of nightmares and anxieties in children.” The fears they arouse are so intense that they can persist well into adulthood. While immediate reactions may be limited to clinging and crying, long-term repercussions can range from sleeping disorders to unreasonably acute fears, such as concern about being critically hurt or killed. Moreover, insists Cantor, shows that seem harmless may be subtly noxious, and it’s often difficult for parents to know what is happening to their children until it’s too late. In addition, children who view regular doses of violence, suggests Cantor, eventually become immune to it and start to seek out more intense levels of violence to get their thrills. There is also the danger, of course, that they can become violent themselves. But Carter’s admonition to parents to play a more active role—that of 24-hour watchdog—in monitoring what their children view is unrealistic. It would seem that children can be safeguarded from the media’s impact only in those few cloistered societies in which televisions and movies are banned. 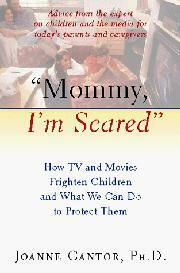 Cantor does, though, offer practical advice to parents in dealing with their children’s fears. A glass of water, a hug, and some comforting reassurance, for example, work best with younger children. All children should be encouraged to talk about their fears, and the focus should be on the unlikelihood of most of them being realized. A challenging, though somewhat hyperbolic, study.